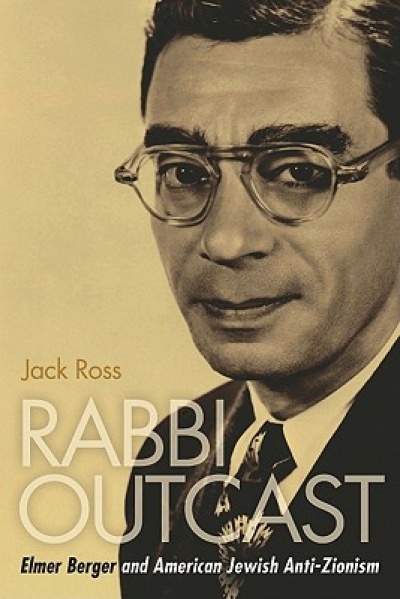 Recently finished Jack Ross’ fine biography, “Rabbi Outcast: Elmer Berger and American Jewish Anti-Zionism.” Highly recommended, especially for those unaware of the American Jewish community’s complex historical relationship to Zionism and the Zionist movement. Rabbi Elmer Berger is not a commonly known figure in American Jewish history, but as the Executive Director of the American Council for Judaism, he played an important role in promoting alternatives to political Jewish nationalism from before World War II through and after the 1967 Six Day War. Today Zionism – and the Zionist narrative of Jewish history – occupies an indelible place in the American Jewish communal psyche. But not long ago it was a point of lively debate in our community. We consider ourselves no longer a nation, but a religious community, and therefore, expect neither a return to Palestine, nor a sacrificial worship under the sons of Aaron, nor the restoration of any laws concerning the Jewish state. Even for those familiar with classical Reform’s opposition to Zionism, it is startling to read that anti-Zionism was actually fairly widespread throughout American Jewish communal life at large. I had not realized, for example, that the American Jewish Committee – today among the Jewish community’s leading Israel-advocacy organizations – considered itself “non-Zionist” even after the establishment of the state of Israel in 1948. I was also rather startled (actually troubled) to learn how deeply the Zionist movement has influenced the evolution of American Jewish communal life. Ross points out, for instance, that the Conference of Presidents of Major Jewish Organizations, considered by many to be the most powerful American Jewish organization today, was originally formed in 1943 as “The Committee on Unity for Palestine” – an effort mobilized specifically to quell dissent over Zionism in the American Jewish community. Jack packs an enormous amount of material into a relatively short book – and those who are not somewhat versed in the history might find its density challenging. But his book is an important one and is well worth the effort. Click above to hear Jack speaking about his book during a recent appearance at the National Press Club. Pay attention carefully – like his writing style, he often strings his ideas together in something of a mad rush. But they are critical and pertinent ideas indeed – and deeply deserving of our attention. This entry was posted in American Jewish Community, Books, Israel, Judaism, Palestine, Religion, Zionism on January 9, 2012 by Rabbi Brant Rosen. Fascinating. I was raised in a secular Jewish anti-Zionist family. It is worth remembering that there was a time, up to WW2, when a very large portion of both immigrant and American-born Jews identified as Socialist, anarchist or communist (various flavors of each) – or simply as Yiddishist. Virturally all Jews of these convictions also would have been non-Zionist, if not anti-Zionist. I am not sure how relevant the ideas this book is pushing are today. No doubt it might also be interesting to read about the clash of ideologies that invovled the Perushim and Tzedukim (Pharisees and Sadducees) 2000 years ago, but that is only of academic interests to historical scholars today. Same with arguments about whether there should be a Jewish State in Eretz Israel. The question of whether there is going to be a Jewish State in Eretz Israel has been settled. Now, of course, American Jews can identify or not identify with Israel as they may choose, but the fact is that not only has the state arisen, but it has pretty much become the world center of Jewish culture and religous thought. As John Weber rightly points out, many American Jews before World War II were anti-Zionists and supported anarchism, or socialism or Communism and spoke their beloved Yiddish language. However, how much of that is left today in American Jewry? Today there is no uniquely Jewish language used by American Jews to convey Jewish thought and Jewish culture. Those political ideologies which once received so much effort and energy by American Jews has been almost totally watered down into a vague notion that it is a “Jewish thing” to vote Democrat and leave it at that. Thus, even if some or even many American Jews “turn off” to Israel for political or cultural reason, Israel and Israelis will continue and keep on “doing their Jewish thing” regardless of what American Jews think or do, thus making Berger’s ideas museum pieces, as I see it. I know this will offend many people who read this site, but to put it blunty is that American Jews need Israel a lot more than Israel needs American Jewry. American Jewry that is interested in Jewish continuity and culture and religious thinking needs Israel and those who cut themselves off are condemning their Jewish identity to a slow but sure degeneration. I recommend the works of Marc Ellis, a professor of Jewish studies and, in my opinion, one of our most important contemporary Jewish voices. Ellis, a religious historian and, despite his protestations, a theologian, has written extensively on hidden American Jewish traditions of dissent including the dissenting tradition of Elmer Berger and the ACJ. I have not (yet) read Ross’s book. But I found the video presentation to be full of historical inaccuracies and anachronisms. I no longer consider myself a Zionist, but I was raised in the Socialist Movement and was therefore at the periphery of organized American Jewish life until neo-Conservatism and pseudo-Zionism became dominant sometime between 1967-69/70. But Ross relates to Zionism as hegemonic since the 1940s and treats it as homogeneous. Throughout the entire Jewish world, when Zionism actually existed as a social movement, it was a fractured minority movement and it central institution was a confederation of competing political parties. One of the few things the various Zionist parties could agree on was that there was no room in the Zionist Organization for fascists and we were (I believe correctly) taught to be proud of Zionism because of all the late 19th and earloy 20th century European [sic!] nationalist movements, only Zionism effectively expelled its fascists. The fasicsts it expelled were the Revisionists — the party of Begin and Shamir and the ideological predecessors of Netanyahu. Reading backwards in history, Ross sees all of Zionism as if the Revisionists dominated Zionist history. They didn’t. But their ideological heisr have dominated recent Israeli history. So again, let me strongly recommend the works of Prof. Marc Ellis. I’m usually reluctant to engage on a message board like this, but Brant invited me too. To Mr. Ben-Baruch, perhaps in the space of a few short remarks I treat Zionism as “monolithic” but I certainly did my best not to in the book as well as generally. Your discussion of revisionism and its trajectory is a vast oversimplification. The whole point of my book is to document the opposition to Zionism as a social movement, in your words, always intended to be a book about American Jewish history and not the Middle East. Which brings me to ike52, who repeats the nonsensical notion that Israel is the source and cause, rather than a symptom, if that, of American Jewish prosperity and freedom, a line of specious reasoning which is simply asserted with no evidence. I don’t see why it should be so outrageous that at least a fraction of American Jews should ask of Israel, as Yitzhak Rabin might have said, for a divorce, not a marriage. Ike52 also raises another interesting point in his assumption that anti-Zionism is monolithic, in other words, that he casually assumes my book is about the historic Jewish left, as a number of other right-wingers have done as well. That they had many ties to the non-Communist left in their time, including to several aging Bundists, I thought was something of a revelation since the ACJ was on many occasions stereotyped as right-wing, and to the extent there is an institutional memory of the old Jewish left today it is the rather manufactured pro-Zionist version peddled by The Forward (which, it turns out, they began as early as the 30s). But I suppose I shouldn’t be surprised that neocons born after 1972 could care less about these distinctions. Finally, while I’ve certainly been aware of Marc Ellis, and even sent him a complimentary copy of the book when it first came out, I was only alerted by Brant’s writings of his importance to contemporary progressive Jewish thought, and will have to avail myself of further study. For more information on a related topic, see ‘Pacifism and the Jews’ by Evelyn Wilcox which includes other figures from the same period in the US and Europe. Early Zionism was inhabited by many pacifists…another unknown but interesting point of view. Wow – I had no idea. I do not consider myself an authority on these matters, but certainly am more knowledgeable than most, and of course am acquainted with Rabbi Berger, but I had no idea. I had a close friend during my high school and university days in the US who was Jewish. Her family were more or less secular from what I remember. I assumed that they were Zionists because I believed all Jews were, but they surprised me on several occasions by suggesting that they did not support Israel. I believe now that they were non-Zionist if not anti-Zionist, but they were circumspect about it all, and I did not feel comfortable asking directly. I remember once being shocked when they said they refused to pay for any trees to be planted in Israel or something along those lines, and naively asking something like “why not? You’re Jewish. Don’t all Jewish people contribute to Israel?” Their careful response was that they believed that charity began at home or something along those lines. It was clear that there was more to it, but I wasn’t about to dig into it with them. I have reestablished contact with my friend, and I may ask her about that one day.